Halloween safety is a must and to help prepare families in the Portland Metropolitan area, the Portland Community College Chapter of the National Student Nurses Association hosted their first "Haunted Hospital". 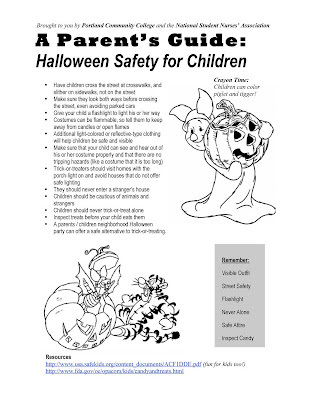 The student nurses had two goals: first, for children to learn a bit more about their own bodies and how they work; and second, to provide their parents with some tips for Halloween safety. Although this is difficult to read, this is the handout that every adult who accompanied their child through the Haunted Hospital received. The students felt it was important that the information be written in easy to understand language, using these evidence-based practices to simplify their educational tool. Bastable, S.B. (2003). 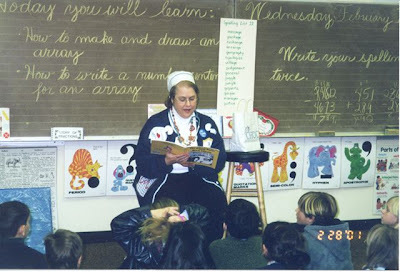 Nurse as educator: , Principles of teaching and learning for nursing practice (2nd ed.). Sudbury, MA: Jones and Barlett Publishers. Prevention and health promotion, that is what the National Nurse campaign is all about. Have a safe and happy Halloween! Kudos! Very informative article, keep up the good work! This blog will be one of the many that I visit everyday. Thank you so much for your tremendous on-going support for school nurses everywhere, and especially in California! I cannot begin to tell you how I personally appreciate all you have done for our specialized area of nursing practice, first through your discussion with Barbara Ficarra on Health in 30, and now by the prominent display of CSNO front and center on your National Nurse website! I know that the National Nursing Network Organization and their supporters have single-handedly helped raise public awareness of the large caseloads of school nurses to students that put the health and safety of our students at risk. I truly believe that school nurses and public health nurses, especially, are at the center of the National Nurse campaign, because their focus is definitely on health promotion, disease prevention, and improving health outcomes for the next generation that is so much at risk. I am heartened when nurses work together to help educate the public. It is an honor to work with you toward the establishment of an Office of the National Nurse that will help all Americans safeguard and improve their health! "Healthy children are better learners!" Hi guys, visit philippine nurses, very useful source for nurses. This is one example of how a network of nurses working together can pass the word on free preventive care in America. You too can help. Please take ten minutes today to tell ten friends to tell ten today! The Breast Cancer site is having trouble getting enough people to click on their site daily to meet their quota of donating at least one free mammogram a day to an underprivileged woman. It takes less than a minute to go to their site and click on 'donating a mammogram' for free (pink window in the middle). This doesn't cost you a thing. Their corporate sponsors/advertisers use the number of daily visits to donate mammogram in exchange for advertising. Here's the website! Pass it along to people you know. October should also be called Iodine Supplement Awareness Month, since Iodine is the key to breast cancer prevention. A good friend of ours just went through an ordeal with breast cancer. The incidence of breast cancer has increased to 1 in 8 women, with 4,000 new cases weekly. You might ask, could there be a preventive measure which is safe, cheap and widely available that has been overlooked? Guy Abraham, MD, Robert Derry MD PHD, David Brownstein MD, George Flechas MD, Donald Miller, M.D. Dr. B.A. Eskin published 80 papers over 30 years researching iodine and breast cancer, and he reports that iodine deficiency causes breast cancer and thyroid cancer in humans and animals. Iodine deficiency is also known to cause a pre-cancerous condition called fibrocystic breast disease. Despite its obvious potential, not much has been done with Iodine treatment over the past 40 years in the United States. Since iodine isn't patentable and is therefore unlikely to be profitable to market, there is no money to fund studies for FDA approval. However, FDA approval is not required since Iodine is already an additive to table salt at the supermarket. For more information see my newsletter. 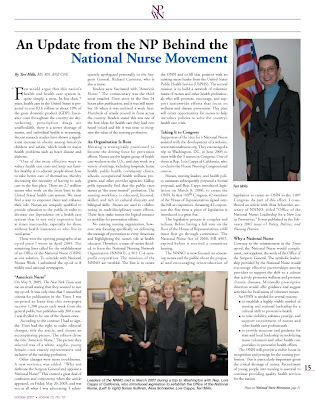 We encourage you to read this article that was published in the October 2007 issue of NP World News, an official publication that reaches over 30,000 nurse practitioners in the United States. This piece describes the campaign to establish the Office of the National Nurse and details the original proposal that led to legislation in the 109th Congress. The Board of the National Nursing Network Organization is working diligently with others to fine tune many points, particularly how we strengthen the Chief Nurse Officer position of the USPHS to become the Office of the National Nurse, and how we can successfully use the current infrastructure of the Medical Reserve Corps to integrate the teams of volunteer nurses and other health care providers who wish to serve their country in delivering health promotion and prevention. We welcome your support, your feedback, and your comments as we process forward. Please email any suggestions to Teri. The above picture illustrates what was thought to work in the past-provide patients with information, and then expect them to adhere to what they are told to do. 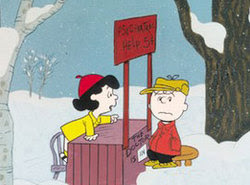 Lucy is so excited to help Charlie Brown, it doesn't even occur to her that he isn't even listening to what she has to say. In many settings, this practice still exists, and often these messages are too complex and in a language that the patient cannot understand. As nurses, we are all too aware that simple health education messages must be reinforced with a variety of proven techniques in order to increase their effectiveness. Of course, one is social marketing, but the Board of Directors of the National Nursing Network Organization would like to share another method that you can begin to incorporate into your own nursing practice or even use with your loved ones. It is called motivational interviewing and was written about in the October 2007 issue of the American Journal of Nursing. We believe this is one evidence based strategy that could be utilized by the proposed volunteer National Nurse interdisciplinary teams to enhance prevention in their own communities. The authors Eric Ross Levensky PhD, Alyssa Forcehimes MA, William T. O'Donohue PhD, and Kendra Beitz PhD describe motivational interviewing as a counseling method for promoting behavioral change and state it is appropriate for use in many health care settings because if can be applied in short (10 or 15 minute) patient encounters. Motivational interviewing has been particularly effective with altering substance abuse, and has produced positive results with treatment adherence, HIV risk reduction, diet and exercise, and health safety practices-just the behavior changes that are the hardest for patients to make. This theoretical model helps healthcare providers to better understand where their patients are coming from and how ready they are to change their behavior. There are four principles: expression of empathy; developing a discrepancy (helping the client to point out that unhealthy behavior is inconsistent with how they state they want to live their lives); rolling with resistance (avoiding any opposition expressed by the patient); and supporting the patient's plan for change. During the interview, therapeutic communication skills that nurses are familiar with such as reflective listening, asking open-ended questions, affirming, and summarizing are used. Motivational interviewing is currently being taught to nursing students across the state of Oregon in schools of nursing participating in the Oregon Consortium of Nursing Education and it is also being used by practicing nurses. This is one proven method that could and should be incorporated within a National Nurse initiative. This thinking is strongly aligned with the work of the National Nursing Network Organization. We continue to be amazed by the number of organizations who are focusing on the importance of prevention and who affirm that nurses will play a key role in helping to keep Americans healthy. They too, know that nurses are qualified health professionals who understand the importance of reviewing the literature, incorporating health and behavioral sciences, implementing interventions supported by positive outcome data, and utilizing approaches that have proven to be effective. As a politically active RN and the Santa Clara County Chapter Director of Health Care for All, who is actively working to see the passage of California SB 840, I am writing to urge you to reintroduce legislation to create an Office of the National Nurse. While researching the Congressional website, I noted that my own member, Congresswoman Anna Eshoo was a co-sponsor of this bill in the 109th Congress. Those who are cared for by nurses know how important we are in preventing disease and keeping them well. There are so many health and nursing issues that need to be addressed on a national and international basis. Potential epidemics of infections disease, natural disasters like Katrina, possible future terrorist attacks, and the nursing shortage requires coordination and leadership at the national level. Having a National Nurse deliver health promotion with the support of volunteer community based teams of nurses and other health care professions would be an invaluable service to our nation’s health. A National Nurse will also portray nursing as a respected career. When I speak with high school students, the majority being Latinos, many articulate young females state they want to become doctors instead of nurses. I encourage and inform them that nursing is a valuable profession. We have a Surgeon General. It’s time for a National Nurse. Healthcare for all is my passion. I am also working on passing HR 676 Conyers/Kucinich, the National Single Payer bill and would like you to consider co-sponsorship of this legislation. Thank you for your leadership in the House Nursing Caucus. I am heartened when nurses work together to help educate the public. It is an honor to work with you toward the establishment of an Office of the National Nurse that will help all Americans safeguard and improve their health.